Cool! 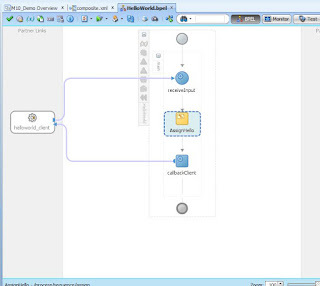 Since BPM 11g PS4FP you can import Oracle Workflow models in BPM 11g. From PS5 (11.1.1.6) it should be possible as well. See this whitepaper. 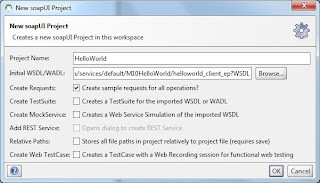 In my previous entry I showed how to create a SoapUI test case to do a WS-Adressing driven request-response interaction with an asynchronous BPEL Process. 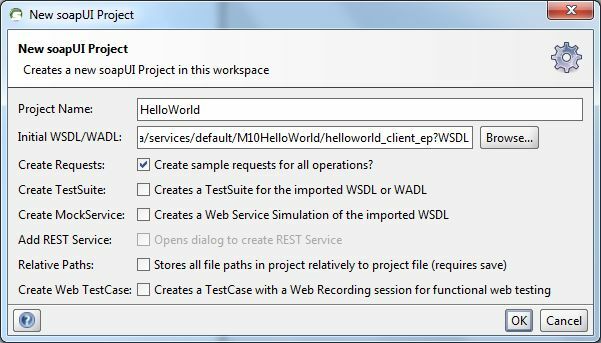 But how does this WS-Adressing request look like? 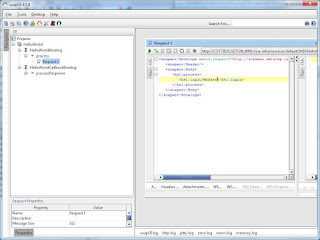 To get this above the water a tool like the HTTP Analyser of JDeveloper 11g may come in handy. 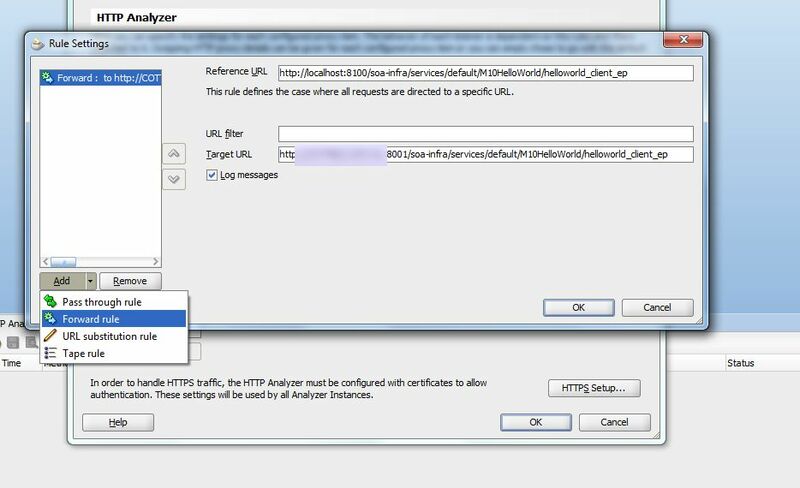 To use it for our purpose we have to create a HTTP-listener with a forwarding rule. 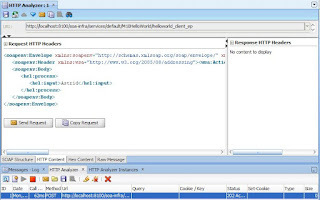 This means that it just listens to request and forwards the request to a URL we provide. 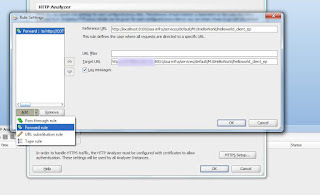 In the reference URL part in the screen above you can put a URL that is used to test the URL Filter. But after playing around I just left this URL Filter field. Now with this configuration each request to localhost:8100 is forwarded to this process. 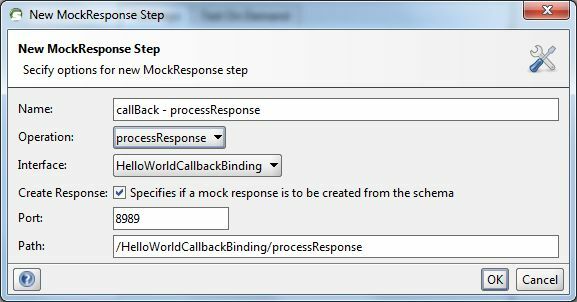 If you need to support multiple processes different rules should be added or in stead of a forward rule a substitute rule should be applied. 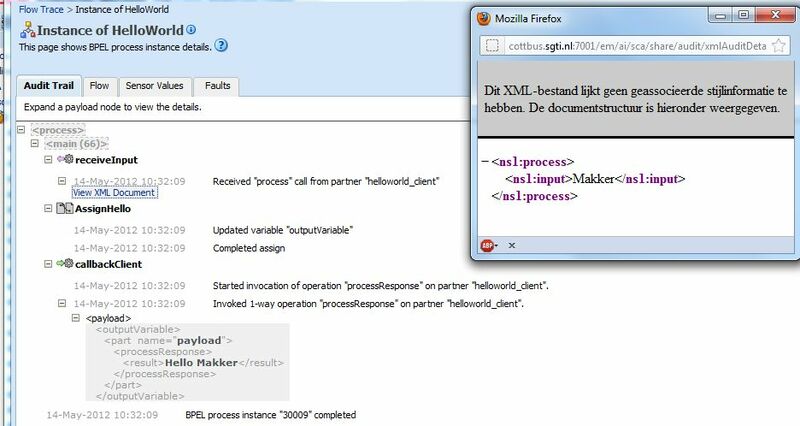 With this each request to localhost:8100 is forwarded to hostname.darwin-it.nl:8001. 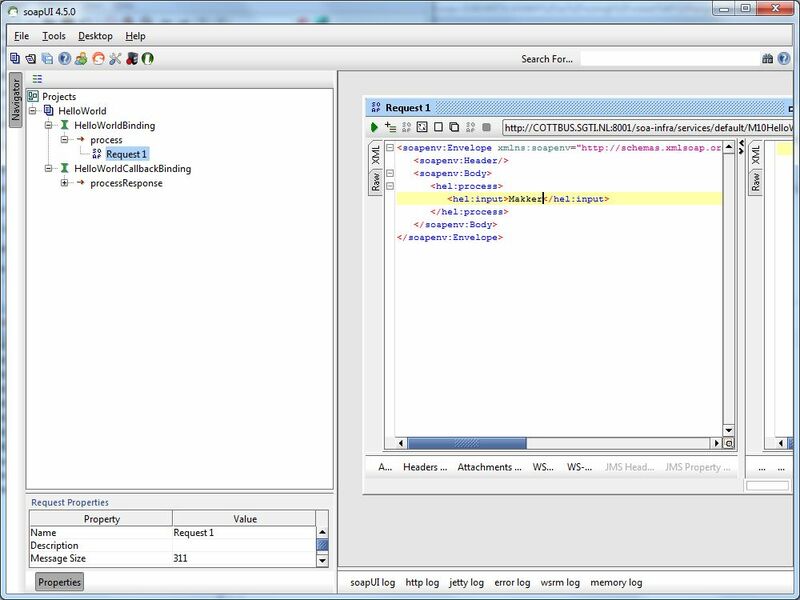 Recently I wrote some blog-entries about scripting in SoapUI. Now I had to help my current customer to test Asynchrounous BPEL processes using SoapUI. 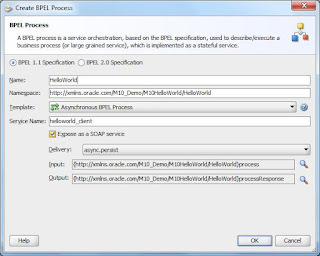 Now calling a BPEL Process (in Oracle SOASuite 11g) from SoapUI is very easy. And if it is a synchronous process then you'll get the response right away. 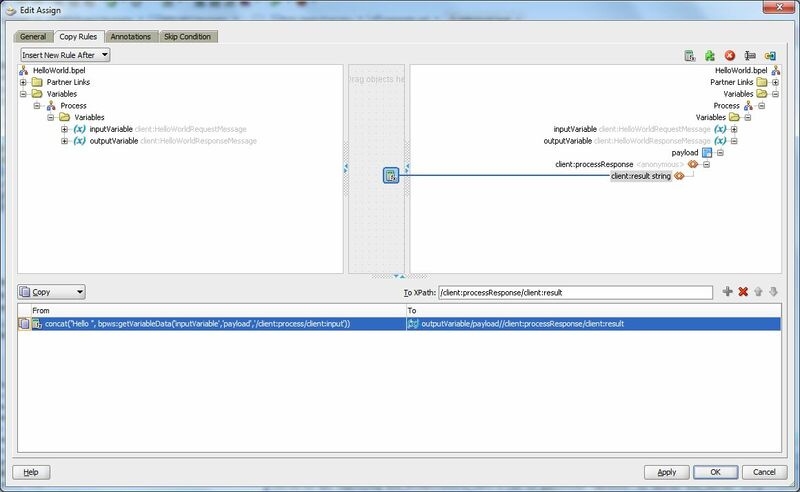 But if the BPEL process is Asynchronous then the response is seperated from the request. 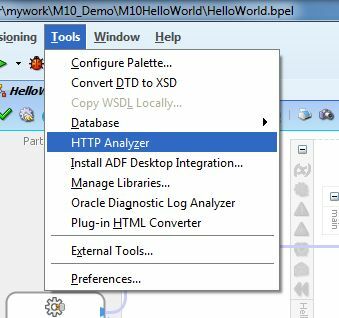 In fact technically an asynchrounous webservice call that is implemented by a BPEL process are two complementary one-way requests. 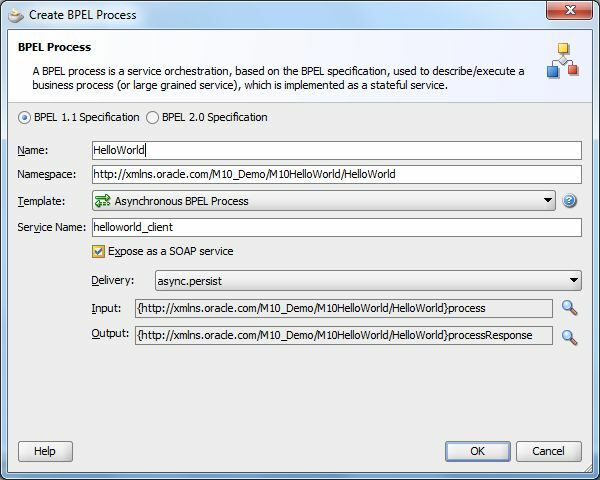 The client calls the bpel process but let then listens to the response of the bpel service. 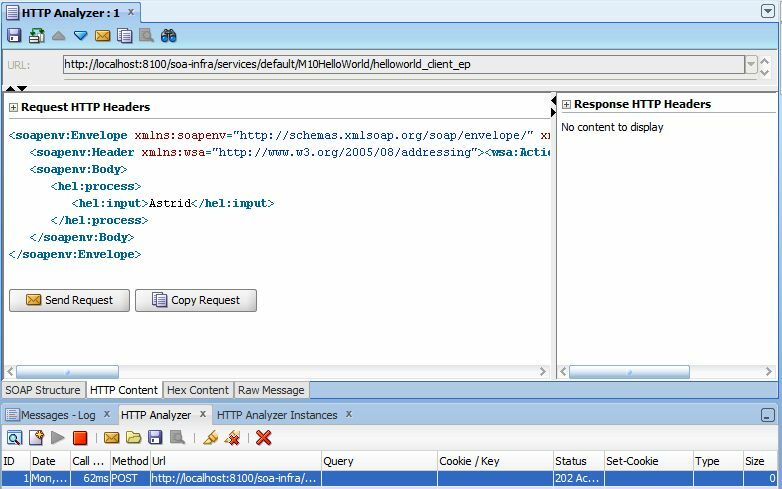 The BPEL service calls then the client with the response. 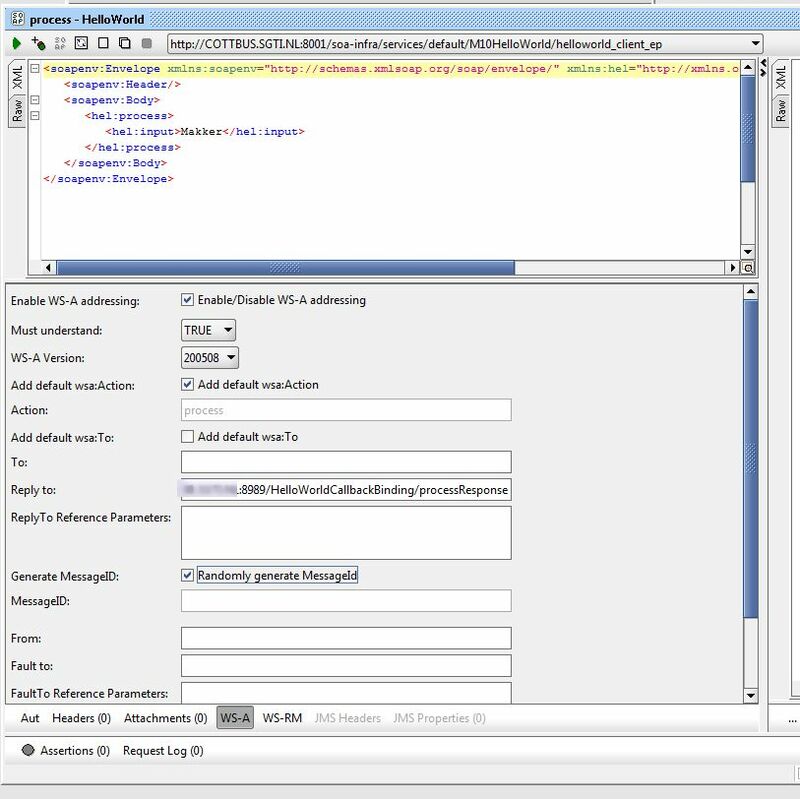 Luckily both SOASuite11g (and 10g by the way) and SoapUI support WS-Adressing and it turns out pretty easy to work it out. 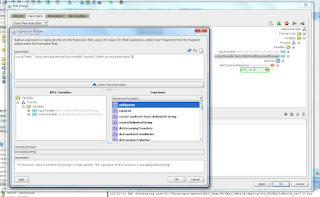 To read more you can find a tutorial on OTN. However, unfortunately the pictures don't correspond to the text, so I found it a bit hard to read. 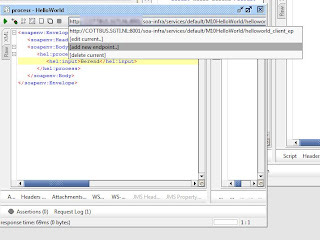 Therefor I made a HelloWorld setup myself. I might extend it in next blogs, if my further experiences are worthy to share (and time let me). Then name the BPEL process HelloWorld and make sure you base it on the asynchronous BPEL process template. 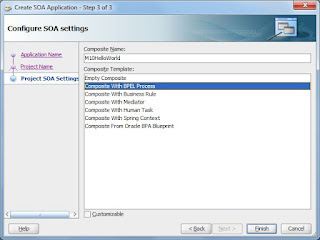 resulting in the following bpel process. 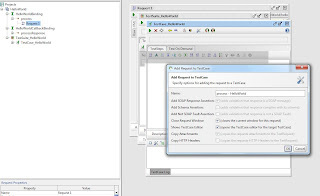 This process can be deployed and run on enterprise manager resulting in the following audit-trail with request message. 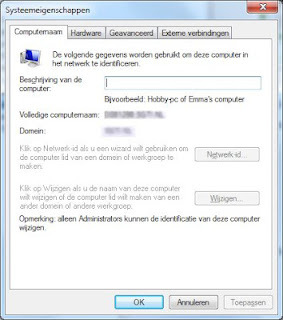 (I obfuscated/blurred my hostname since it is a machine at my customer in this example). This will ask you to set the operation to mock. 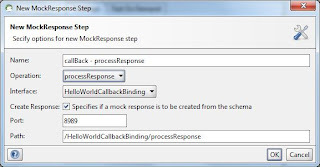 Make sure to set the interface to the HelloWorldCallBackBinding, and the operation to processResponse. 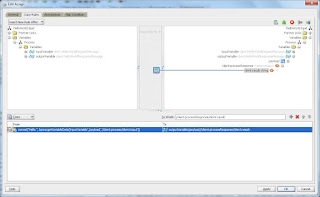 (first set the interface, then the operation above will automatically set to the only one in that interface/binding). 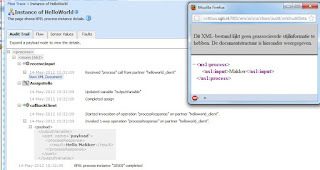 For the path I choose to concatenate the binding-name with the operation-name from the WSDL. 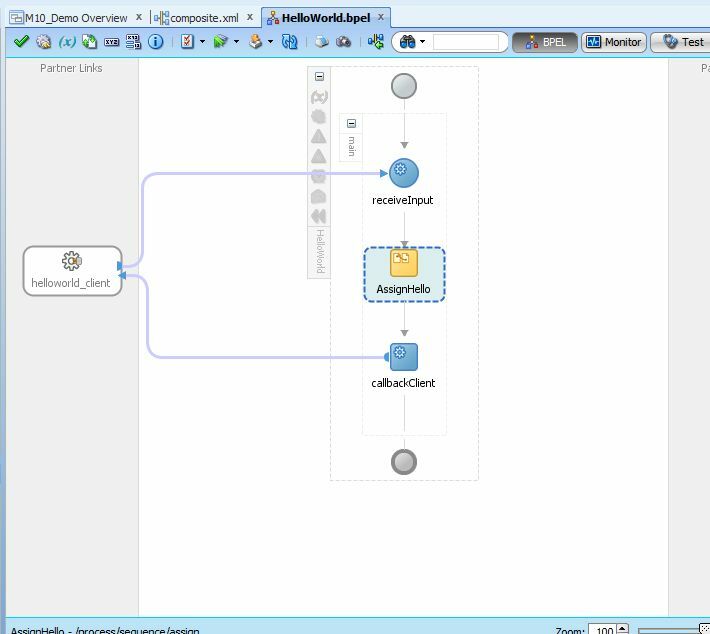 These two entries are important since they will make-up the end-point that is mentioned to the BPEL process in the WS-Addressing node as the address it should call to send the response back. 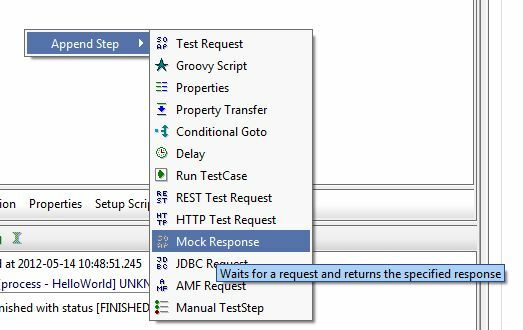 You might need to resize the window and drag the splitter between the request and response message panel to the right to see the tab at the bottom of the request pane. As simple as that. 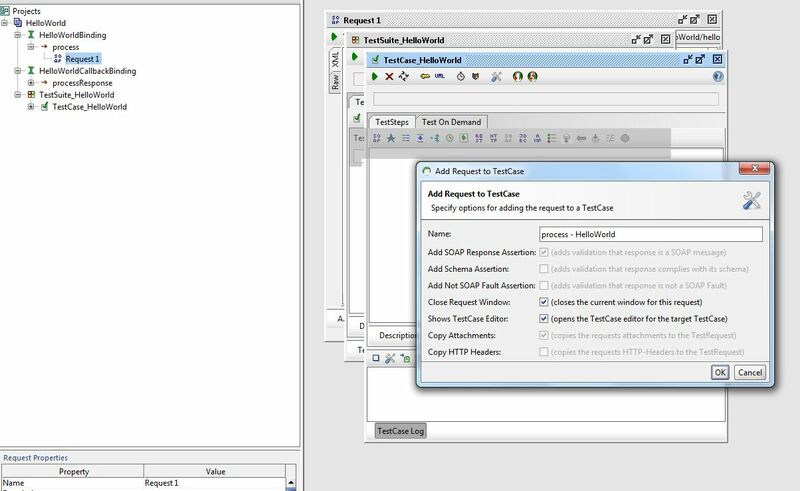 Now you can expand your test with assertions and adhoc interactions with your BPEL process or call another with the output of this one. 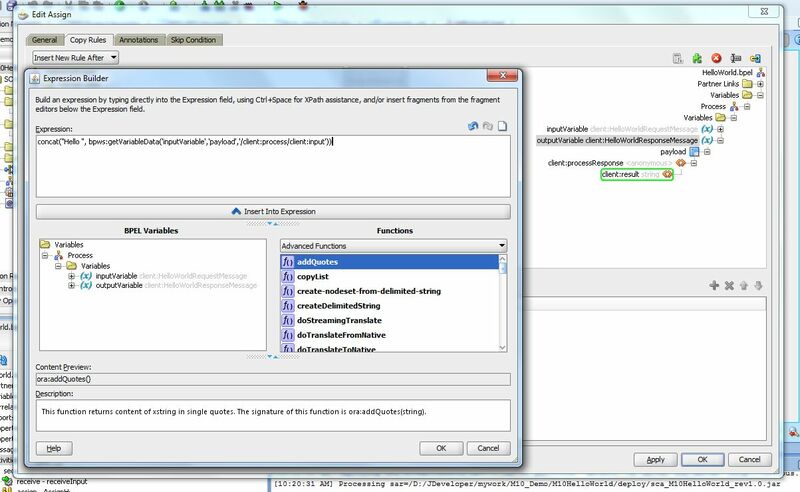 Also it might be handy to use the scripts in my former blogs to write the response to a file in a folder on the file system. 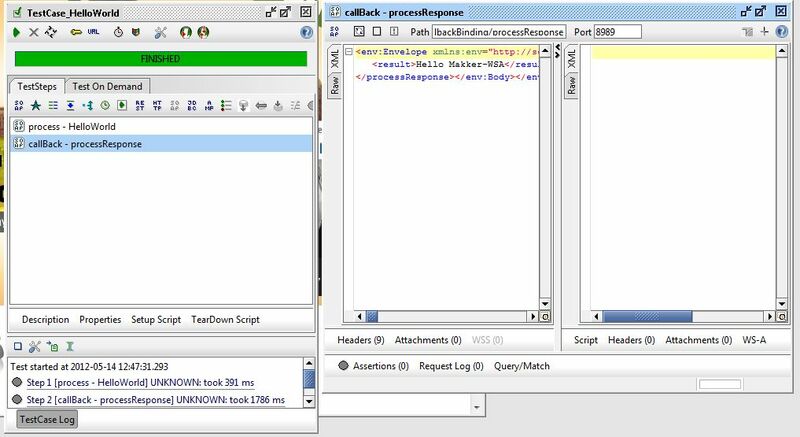 But how would the message adapted with the WS-Addressing node look like? 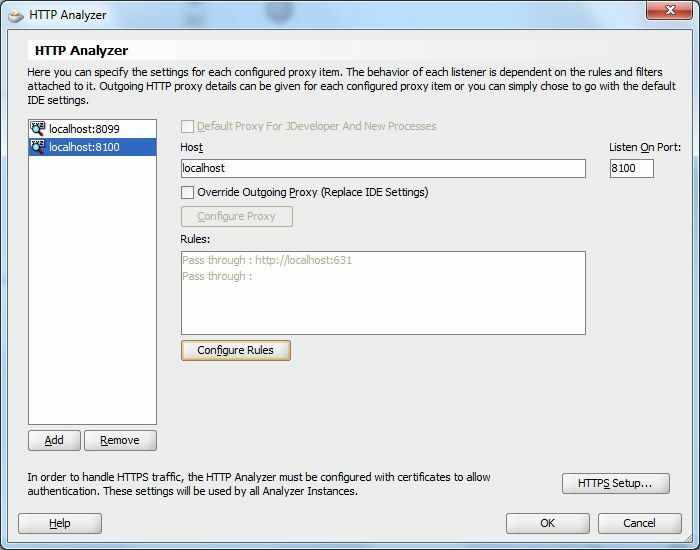 Well that can be investigated using the HTTP Analyser in JDeveloper. 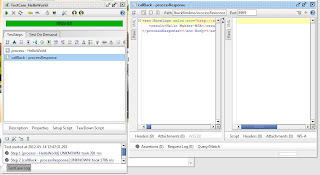 Let me demo that in a next blog. 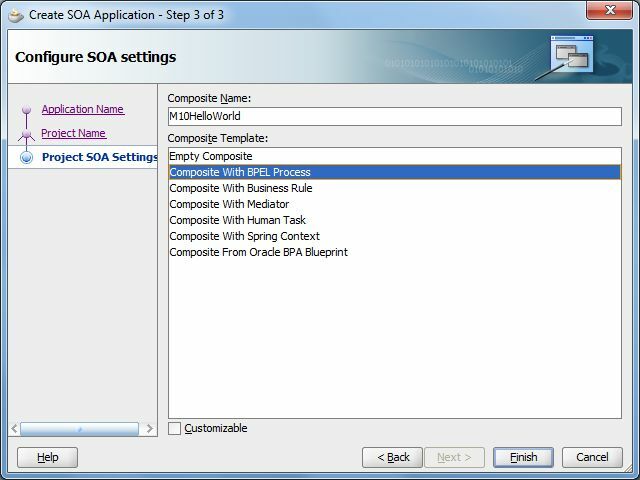 Then (in our case) the SOA_Infra should be able to start. In file E:\oracle\admin\domains\soa_domain\bin\setDomainEnv.cmd By the way, our SOASuite environment was a 11.1.1.6 setup on windows.